First of all, the fact that all four gospels record the resurrection of Jesus Christ proves that either the authors knew nothing about getting books sold, or they were committed to telling the truth, the whole truth, and nothing but the truth. Because the resurrection is the hardest pill to swallow and a real popularity-killer. And the fact that the early church did not edit out the resurrection story further proves that the incredible rising of a dead man back to life was a narrative they were willing to suffer for. Which they did, not only in lack of popularity but in imprisonment and execution. But now let me mention how the resurrection intentionally affirms the value of women. You are surely aware that throughout history, women have generally been regarded as having less authority and credibility than men. This continues in many societies today, and it was certainly the case in the period during which Jesus lived on earth. In fact, a valid witness in a Jewish court of law had to be free (not a slave), passed bar-mitzvah, mentally competent, able to hear — oh, and male. So if the New Testament writers were scripting a narrative to show the resurrection was a historical fact, the witnesses would by no means be women! Enter the God of surprises. Culturally speaking, the Apostle Peter would have been a better choice. The outspoken, Type-A “rock” of the church would have commanded attention as the lead witness. But no, God chose for His first witness a woman whose life had been in tatters till she was delivered by Jesus. What does she know? Mentally, is she together? “She went and told those who had been with Him, as they mourned and wept. And when they heard that He was alive and had been seen by her, they did not believe“ (Mark 10:10-11). So a magnificent angel (“His countenance was like lightning, and his clothing as white as snow” Matt. 28:3) roars into that cemetery. The Roman guards keel over as dead. He assures Mary and some other women who have now gathered, that Jesus has risen. Go tell the men, he says. So they head off, amazed and in shock but joyful. On the way, “behold, Jesus met them, saying, ‘Rejoice!’ So they came and held Him by the feet and worshiped Him” (Matt. 28:9). And He told them to not be afraid. 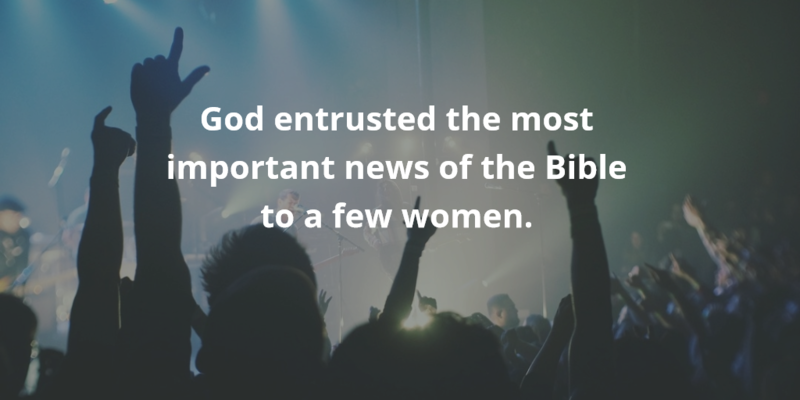 God entrusted the most important news of the Bible to a few women. No novelist concocted this story. But male historians recorded it and came to believe it. I thank God for His radical view of womanhood. Our Christian history, our faith, our world would be woefully lacking without women then and now. Sisters, we need your faith and your voice of truth today. Go, tell His disciples that Jesus Christ has risen from the dead! Please let me stay in touch with you….